In a series of Q&A’s, IAVA is sharing what #VetsRising means, and is, to our members. Meet David Dickerson, a U.S. Navy and Army veteran who resides in Oklahoma City, OK. The opportunity to continue serving. I had followed IAVA since 2005, and after they were such an integral part of getting the Post-9/11 GI Bill passed, I was convinced IAVA was for real. I kept an eye on the organization, noting its growth and advocacy on such important topics as don’t ask, don’t tell (DADT), the disability claim backlog and improving the Post-9/11 GI Bill. After I retired in 2013, I chose IAVA as the main veteran organization to affiliate with. I liked the way it was breaking the mold of what a veteran organization was and how it operated. I especially liked the attitude of Tom Tarantino, IAVA’s then Chief Policy Officer, had exuded whenever I saw him on various media outlets – turned out it must have been some of the cavalry attitude coming across. Now that I have two sons in uniform, I consider being part of IAVA as a way to look out for them beyond being their dad. I think we owe it to the next generation of warriors to do for them what previous generations of veterans have done for us. Tell us about your involvement in IAVA’s partnership with Victory Motorcycles. What have you seen during our engagements, from Rolling Thunder in DC to the Sturgis Motorcycle Rally in South Dakota? 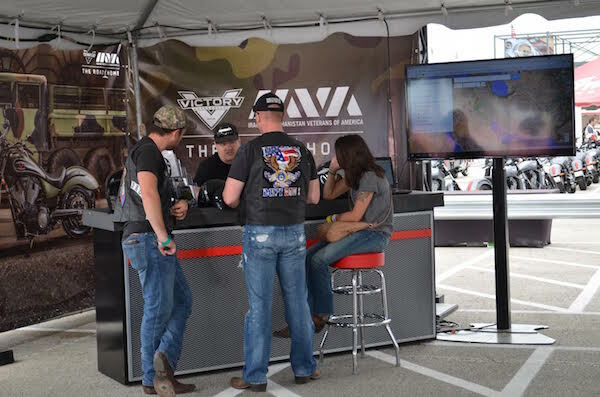 Through our partnership with Victory Motorcycles, I’ve had the opportunity to tell thousands of people about the work IAVA is doing to support and empower this new generation of veterans. During the Sturgis Motorcycle Rally last year, when I mentioned that 22 veterans a day take their own lives, the reaction in the audience was visceral. The biker community is predisposed to support veteran causes but it was clear many had never heard of this issue. 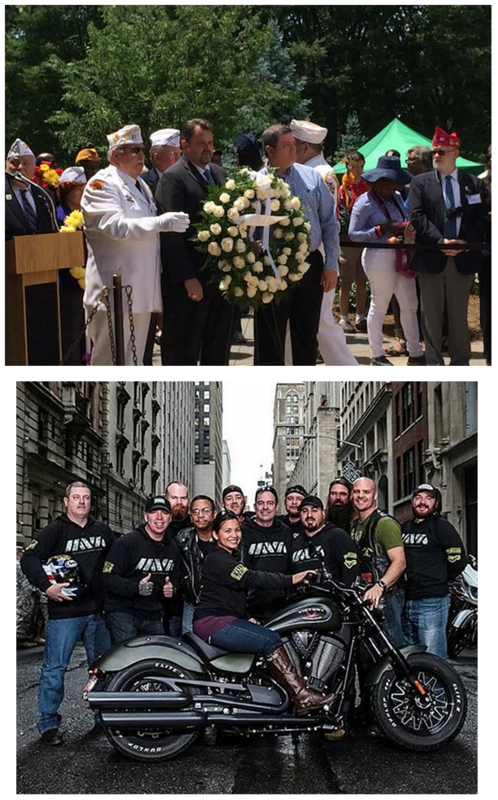 I saw jaws drop, and even some tears – it was grizzled old bikers, younger professionals in full leathers and even a few families that heard the issues our veterans are facing for the first time, and what IAVA is doing about them. Later that month, I was privileged to take several IAVA leaders from across the country to tour the Polaris engine assembly factory. The response from the people in the assembly line, once they saw our IAVA shirts, was one of great pride in being part of a company that has chosen to support post-9/11 veterans in such a big way. From the amazing experiences on the road to the incredible people on the Victory Motorcycles team, this partnership has had a direct positive impact on me personally. I’ve even started riding again after more than 25 years! As you reflect on the varied ways you’ve been involved with IAVA, what experiences have resonated the most and why were they so impactful? When the extent of veteran suicides became clear, I knew I wanted to be part of the call to action. I soon found myself on the National Mall as part of Storm the Hill (STH) in 2014, standing amongst nearly 1,900 American flags representing every veteran we had lost to suicide that year alone, and wondered how I got there. It is a scene that I will always carry with me. It was an honor to help make Congress aware of this issue and fight for the Clay Hunt Suicide Prevention for American Veterans (SAV) Act passage, a suicide prevention bill named after Clay, a veteran who lost his life to suicide. After returning home from STH, I started to build an IAVA team in Oklahoma, modeled on the IAVA group in North Texas whose leaders I met at Storm the Hill. VetTogethers of all types followed and I was asked to speak about contemporary veteran issues on local and tribal radios here in Oklahoma several times. As far as other experiences, 2015 will be hard to match. I found myself in the White House at the Clay Hunt SAV Act bill signing ceremony. I met Clay’s mother and stepfather who are simply wonderful people. I went to Daytona Bike Week, where I was honored to represent IAVA with its new partner Victory Motorcycles and speak with hundreds of veterans and civilian supporters. During a Memorial Day ceremony, I laid a wreath at the Tomb of the Unknown Soldier. After a Veterans Day Ruck March/Walk in Oklahoma City, I developed a relationship with the Oklahoma Department of Veterans Affairs, which was especially impressed by our bringing Mental Health First Aid to the state and across the country. In January, with the support of ODVA, we held a large MHFA class for various state, federal and private organizations serving veterans across Oklahoma. I am also very fortunate to have been able to visit the IAVA offices in NYC and DC. It has been extremely gratifying to see the dedication and hard work the staff puts into supporting IAVA members and every post-9/11 veteran and their families. It is easy to tell people who ask about IAVA the reasons we are able to do so much with far less resources than other veteran organizations.